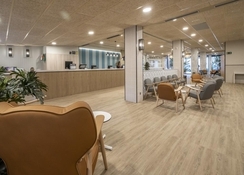 Hotel Rosamar Garden Resort, located just 300 metres from the stunning beach in Lloret de Mar, is one of the most sought-after hotels in Costa Brava, Spain. This 4-star property features 4 swimming pools, a mini golf course, terrace garden, Jacuzzi, Turkish bath, beauty and spa treatment services. With a buffet restaurant that serves a diverse range of Mediterranean and international cuisines along with featured cookery shows and poolside bars to help you savour refreshing snacks and drinks, Rosamar Garden is a complete holiday paradise. The hotel also boasts a multi-sports court for basketball, tennis, volleyball and mini football, as well as a dedicated sports area. 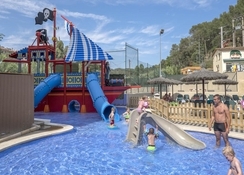 Kids are in for endless fun at the hotel, which offers mini club, kids’ club, mini disco, fun activities and most attractive of all, an onsite Aquasplash waterpark featuring exhilarating waterslides, beach swimming pool and numerous water attractions. The hotel also arranges for evening entertainment services catering to the mood of families. At just 4 minutes’ walk from the beach, Hotel Rosamar Garden Resort is 23 km from Girona-Costa Brava Airport. The hotel is strategically located amidst beautiful coastlines, water parks, golf courses and shopping arenas. 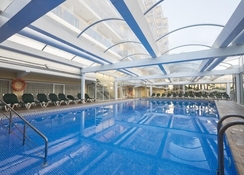 The city centre of Lloret de Mar is only 5 minutes from the hotel. The hotel houses 300 double rooms and 50 apartments that can accommodate from 2 to 5 people. The double rooms feature an additional bed for additional guests, while the apartments have a separate bedroom and a living room with two sofa beds. All the accommodation units are spacious, modern and come with furnished terrace, bathroom (shower or bath) with hair dryer, flat screen satellite TV, air conditioning and heating, refrigerator, telephone, safe, reception service 24 hours and Free Wi-Fi. The apartments are provided with kitchen utensils, electric cooker, refrigerator and microwave free of charge (on request). Hotel Rosamar Garden Resort serves breakfast, lunch and dinner in its main buffet restaurant that dishes up a wide selection of Mediterranean and international cuisines. There is mini buffet for children and a dessert buffet. The hotel also hosts show cookery in the same dining hall. For drinks, guests can head to Bar Marys and the Pool Snack Bar Goofy – both serve a variety of drinks and snacks. 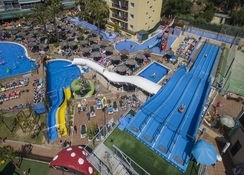 The latter is located in the hotel at Aquasplash area. At the seafront is Restaurant Cafe Ferretti serving pizzas, crepes, ice creams, coffee, juices, iced drinks and smoothies. 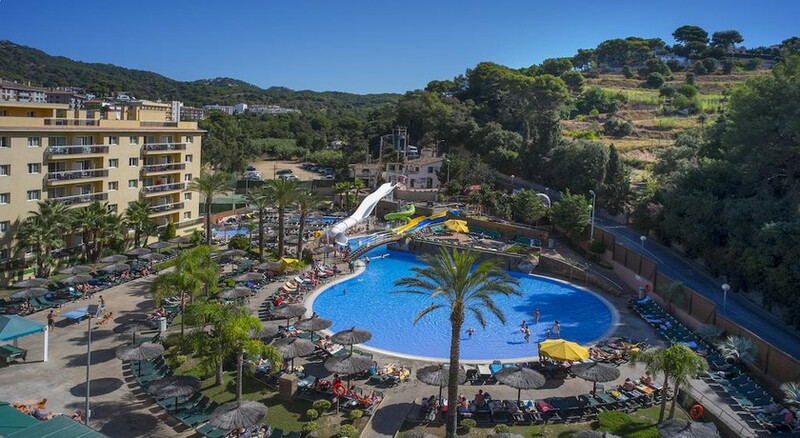 At the Hotel Rosamar Garden Resort, you can make a splash at the 4 swimming pools (3 outdoor and 1 indoor heated in winter), Aquasplash area that has fun water slides and 3000 square metres of gardens. You can rejuvenate yourself at the hotel’s spa that features hydromassage, sauna and Turkish bath. For fitness conscious folks, the gym stays open round the clock with fitness instructors on board. 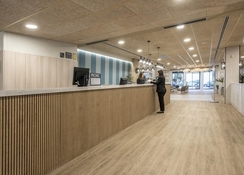 Besides, the hotel also has a multi-sports court and a sports area where you can enjoy basketball, volleyball, tennis, mini golf, archery, petanque and rifle shooting. For younger guests, the Rosamar Garden has a mini club for 4-7 years, a kids’ club for 8-15 years, playground, mini disco and entertainment shows. Adults too can enjoy loads of entertainment activities and shows. A perfect hotel for families, my children were well catered for leaving us parents time to relax. I had a lovely week here with my daughter and my mum. The hotel room was adequate for what we wanted. We did have a rubbish view but wasn't the end of the world. Always managed to get a sunbed which is great as been places where they all go before! Had breakfast at the hotel and ate out every evening which was nice. Entertainment was quite young and my daughter who is 11 felt it was beneath her this year!! But absolutely loved the slides and pools.